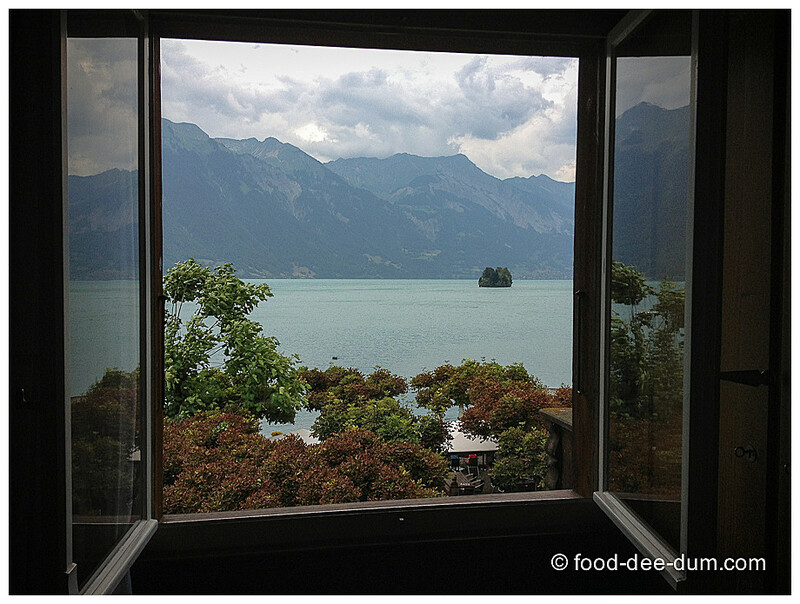 Picking up from Lavaux & Gruyeres, this is the third part of my Switzerland series. 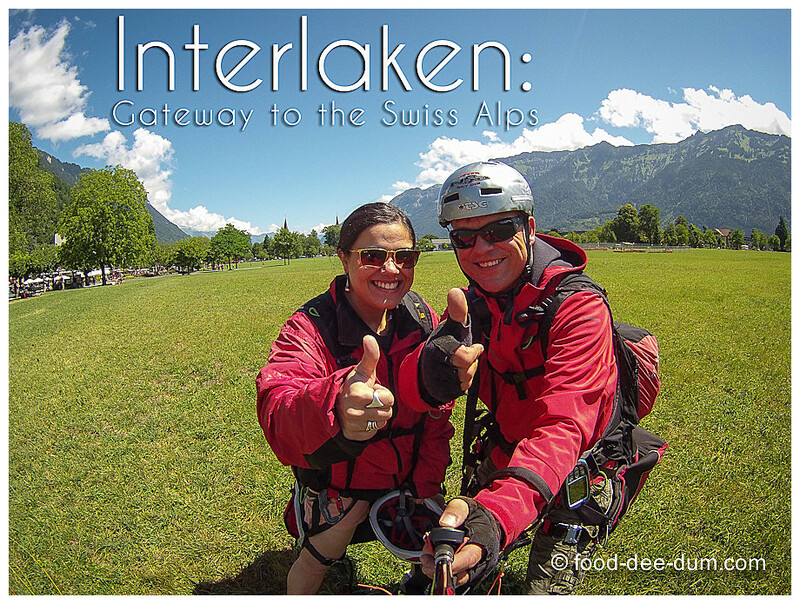 Interlaken is quite a popular tourist spot, more so with Indians and almost all other Asians. 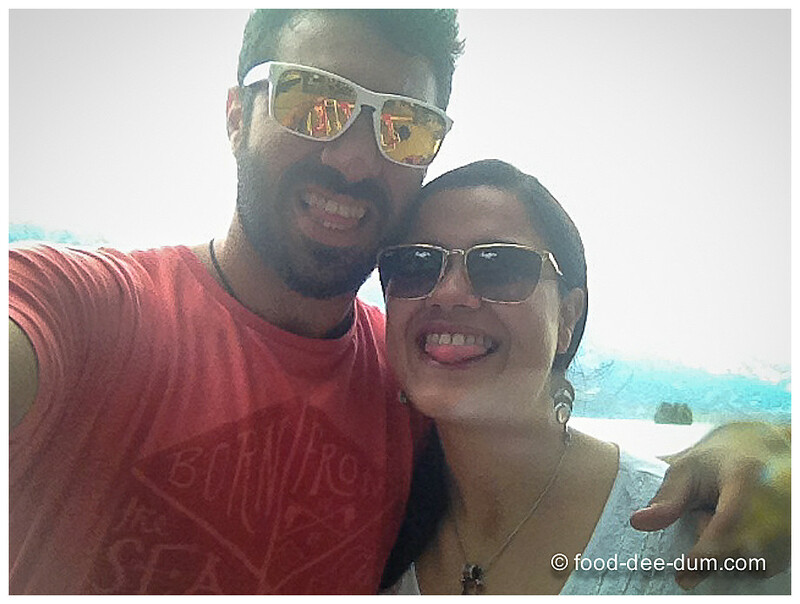 So even though we had decided to explore that region for 2-3 days, we were not keen to stay in a busy tourist spot. 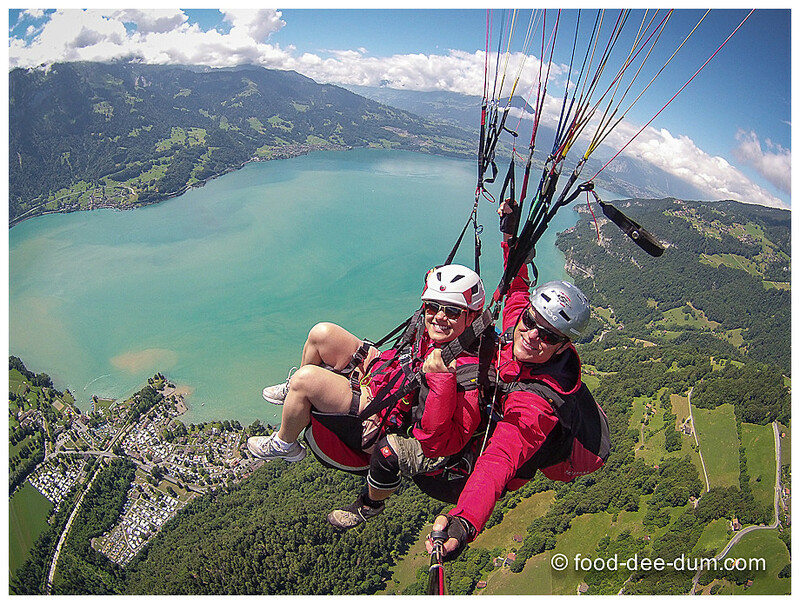 A small town in the middle of 2 lakes – Lake Thun and Lake Brienze and alongside the river Aar which connects the two lakes – Interlaken is an excellent spot to be in if you want to indulge in adventure sports — like paragliding, hand gliding, bungee jumping, sky diving, canyoning etc — or if you want to visit the Jungfrau, the third highest and most visited peak of the Bernese Oberland. We decided to spend the majority of our time around Interlaken, rather than in the middle of it and just use it as a base. 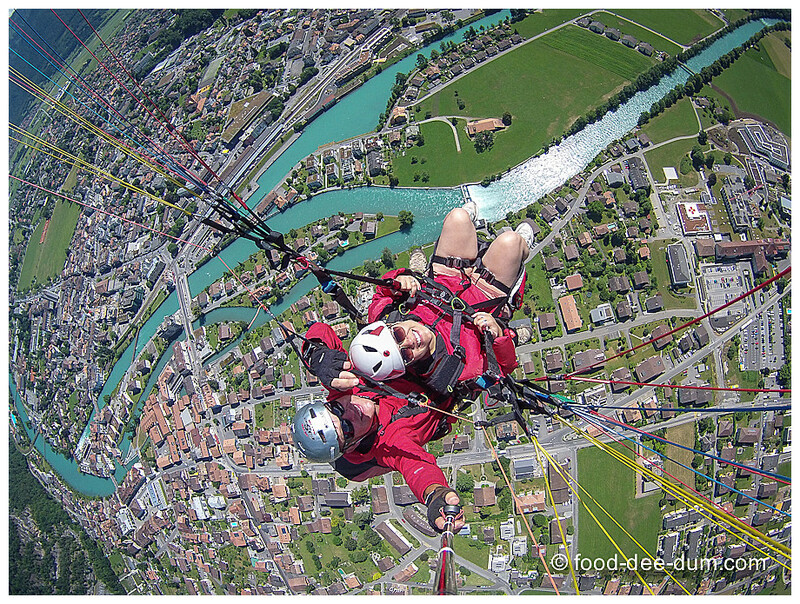 So we made our bookings for a hostel in Iseltwald, a small village which was a 20 minute bus ride from the Interlaken Ost (East) station, returning to Interlaken only on our last day for some Paragliding. 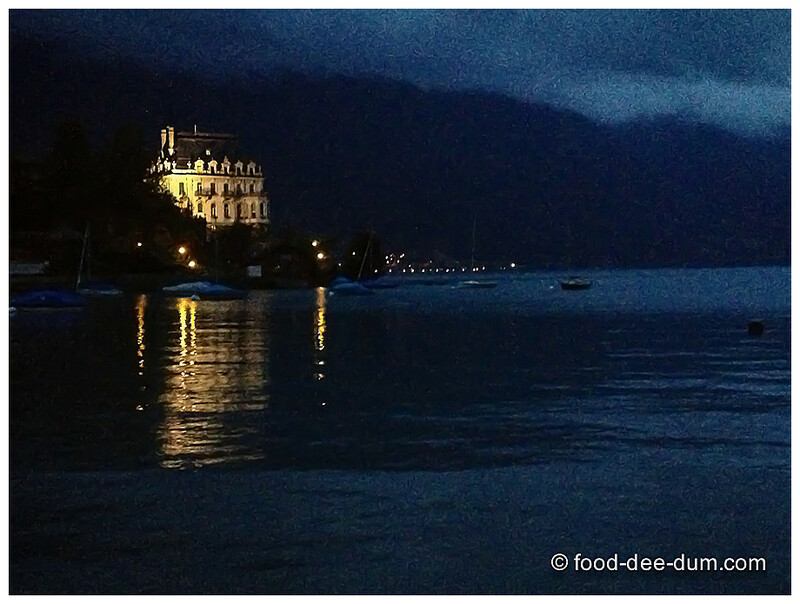 We head out from Lausanne by train on Sunday morning – the journey was approximately 2 hours. But instead of heading to our hostel from the Interlaken Ost station, we took another 40 minute train to Lungern (on the way to Luzern from Interlaken) to meet some friends for lunch. 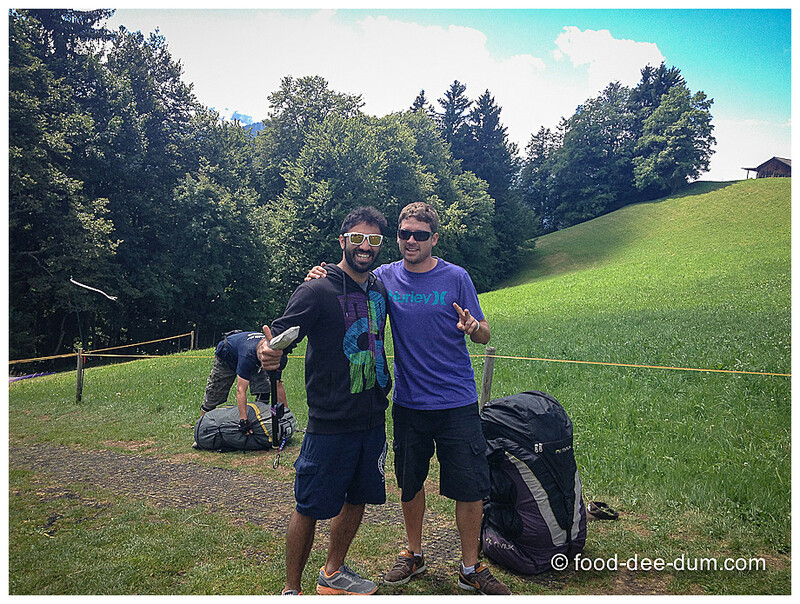 They were headed to Zurich from Interlaken and suggested that we meet at this place. The lake at Lungern was, officially, the prettiest lake that I saw during my entire trip. This was our first view from the train. From the station, the lake was a 5-7 minute walk downhill and we decided to have an impromptu picnic lunch – buying beer, cheese, bread and some chorizo from the local gas station. Adit and my friend Feroze decided to take a quick dip in the lake too, but I did no such thing because I had stashed my bag at the station instead of lugging it around for a few hours! If we had known about this place then maybe we would have stayed here for a night as well. The only dark spot was the noise made by the Air Force while they practiced some drill over this area. I think that they were prepping for the Swiss National Day which was up in a few days. If you visit this area for a few hours, then there is a restaurant across from the station where you can buy food and take to the lake, or simply eat there. And, since this station had no lockers, you can request the restaurant to hold your bags while you explore the lake. 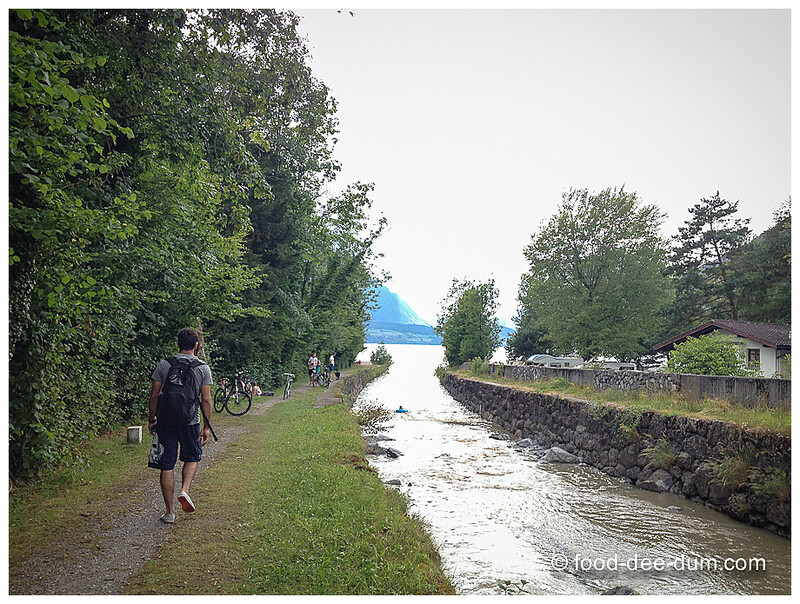 After a few relaxing hours by the Lungern Lake, we made our way back to Interlaken Ost station and took the bus to Iseltwald – it was about a 20 minute ride. The hostel was a 2-3 minute walk from the bus stop. 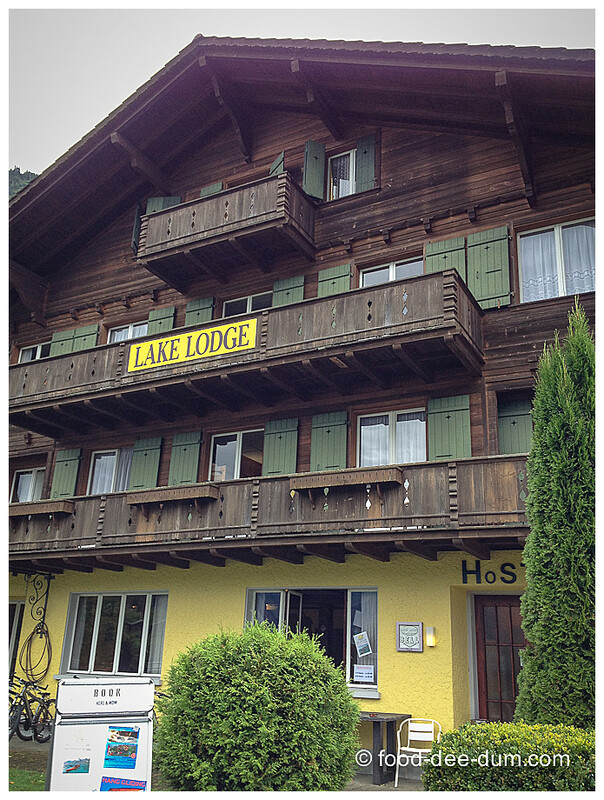 Arriving at our hostel at about 5 pm, we checked in and made ourselves comfortable – it was a typical Swiss Chalet converted into a hostel and called Lake Lodge. The first view from our room. The hostel was right AT the lake but, sadly, the weather became a bit stormy and there was rain predicted for most of the duration of our stay. Since most of the day was over, we decided to hang out at the restaurant right across the hostel – have a few beers and something to eat before we explored the area. 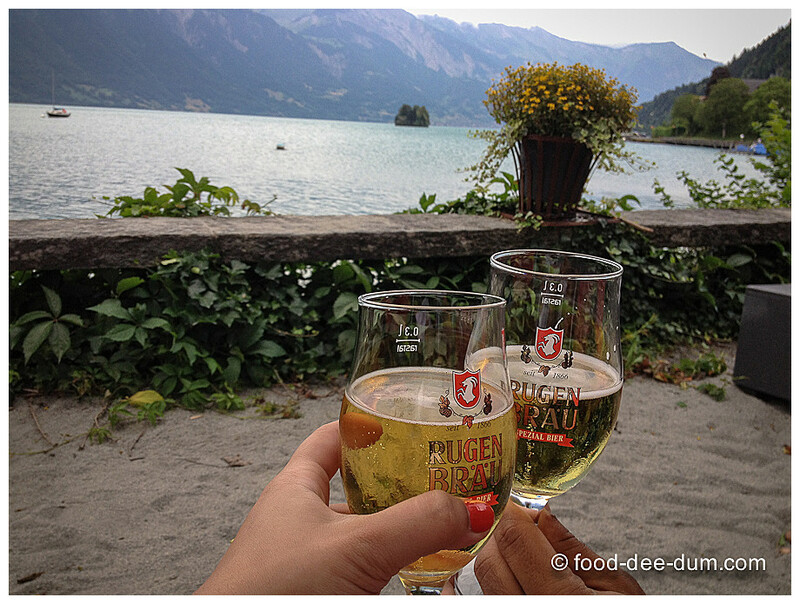 This is the local beer from Interlaken and we definitely had to try it! And then have some fun with photos! The front desk at the hostel suggested a walk to a waterfall – about 1 hour away – but the weather was too unpredictable and the storm was expected anytime, so we decided to walk up the hill just until we felt comfortable. 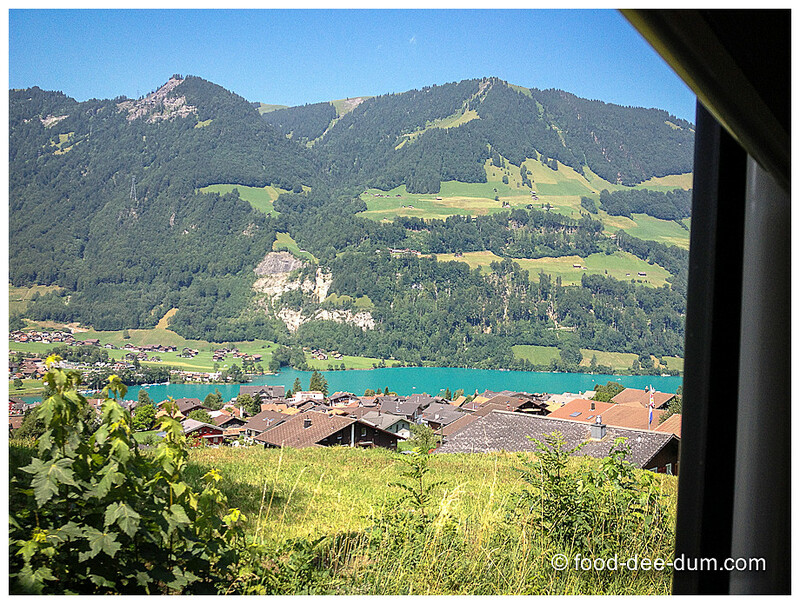 We were right on top of the highway to Bern in about 1.75 kms and decided to head back – finding pretty views of the lake from above and many camp sites and hiking trails along the way. 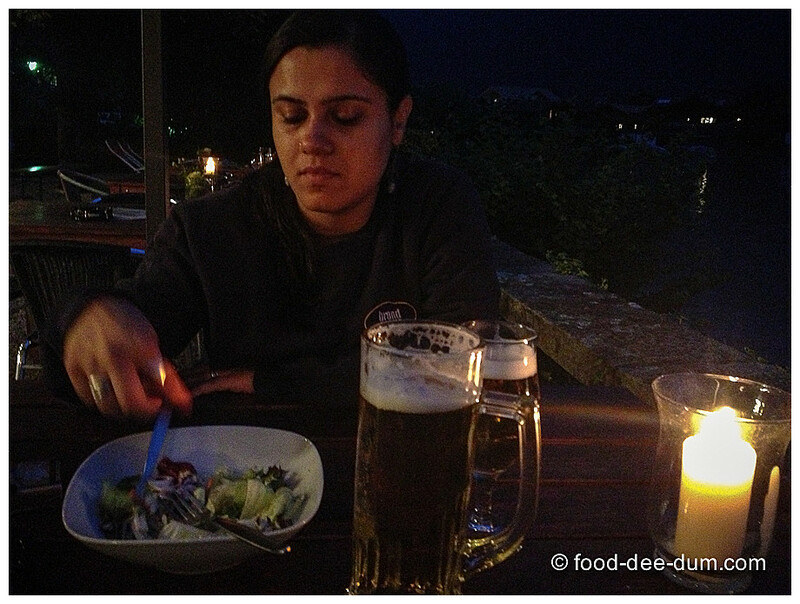 We returned for more beer and dinner to the restaurant across from our hostel and had delicious roast beef and salad! The hostel offers bicycles, kayaks and paddle boards for rent as well as wet suits – so we intended to take advantage the next day. Unfortunately, the next day turned out to be a super rainy one and we were totally unprepared – no umbrellas/ ponchos and the hostel didn’t have any to lend us. See how cloudy it was? And that’s the restaurant across the road – the name of which I just cannot remember! So we slept in and eventually borrowed garbage bags to protect ourselves and go looking for food! Making a dash for the grocery store and soaked despite our garbage bag ponchos, we discovered that it was shut! The sign outside said that the store would remain closed from 1-4 pm and then shut again at 6 pm! Keep this in mind if you stay in small, sleepy villages in Switzerland, or even other places in Europe! The restaurant across the road was also shut (as you can se in the picture above!) 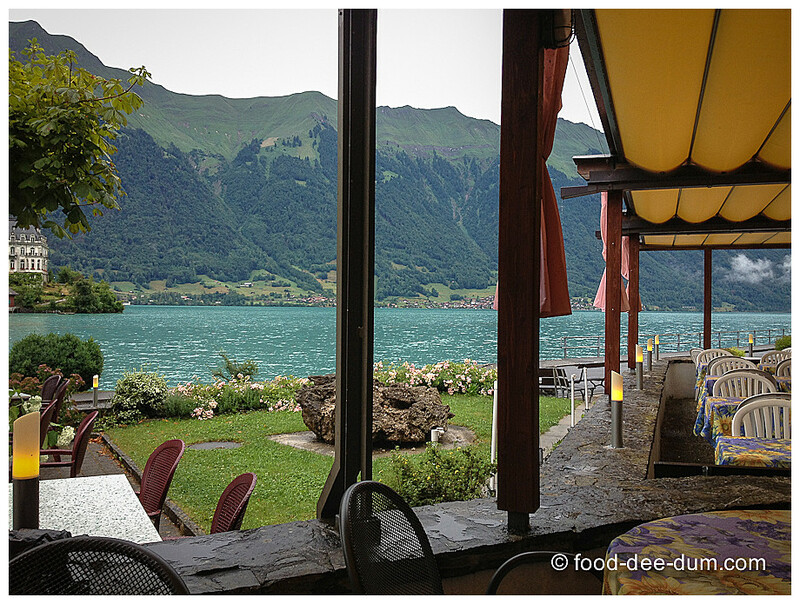 and we had no choice but to head to one of the more expensive hotel restaurants up the road – so we made a run for it and settled for the outdoor restaurant at Chalet du Lac. Soaked and freezing, we decided to start with some hot chocolate and enjoy the view! There was no rush because the restaurant was open all day. 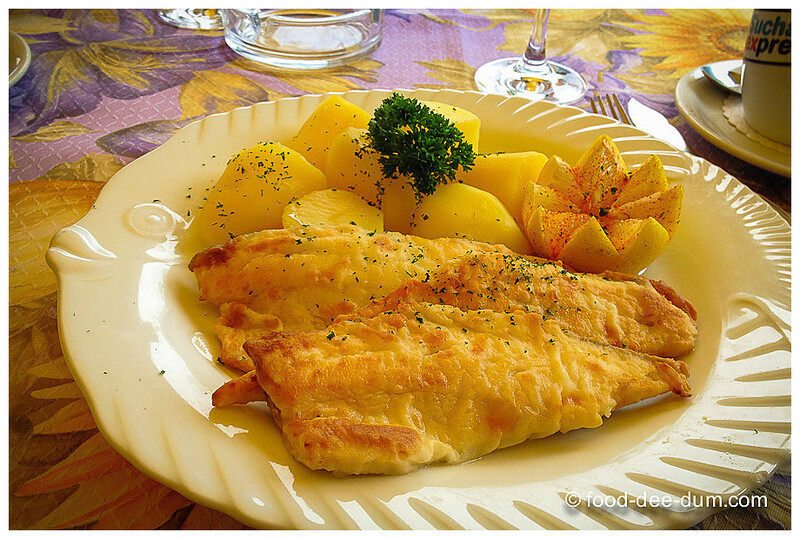 Once we were nicely warmed up, Adit got a mixed salad and I had the white mountainfish – lightly fried in butter and served with potatoes and lemon. 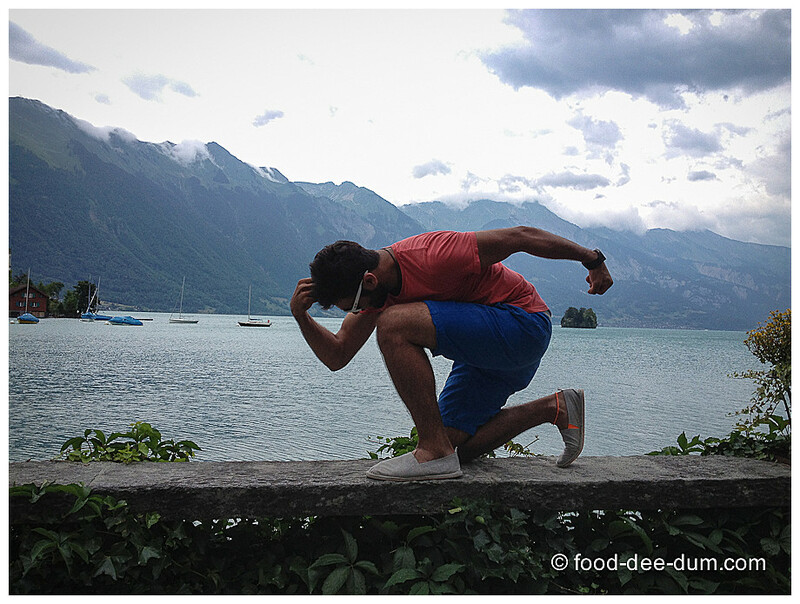 In this part of Switzerland, the white mountainfish is a specialty and you should try it. It was delicious! And of course we had a carafe or two of white wine as well. 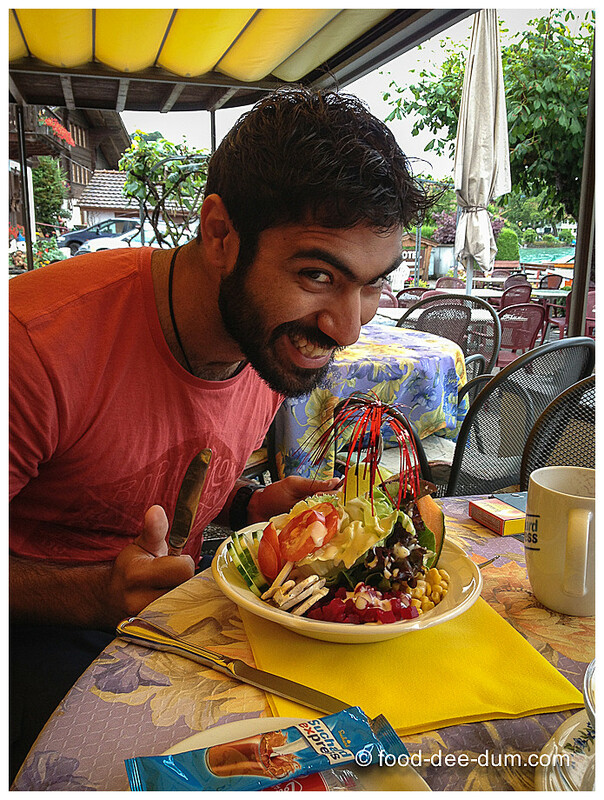 Don’t miss the fish-y plate and the pretty decoration on top of Adit’s salad! Fun fact: while we were waiting for our food to show up, we checked Wikipedia and apparently, Iseltwald has a total population of 430 people! I had trouble coming to terms with that scale! 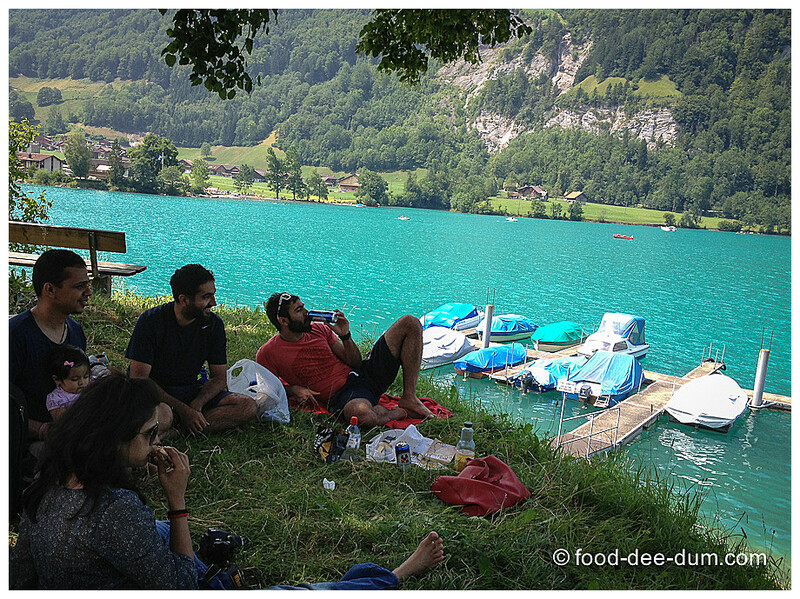 A little later, we went back to the store and shopped for another picnic dinner – Adit’s friends were taking the bus from Interlaken to have drinks and dinner with us. We made it just in time, before the store closed, and bought WAY too much food, beer and wine! But we got to try some of the local goat cheese from the region and it was definitely worth it. 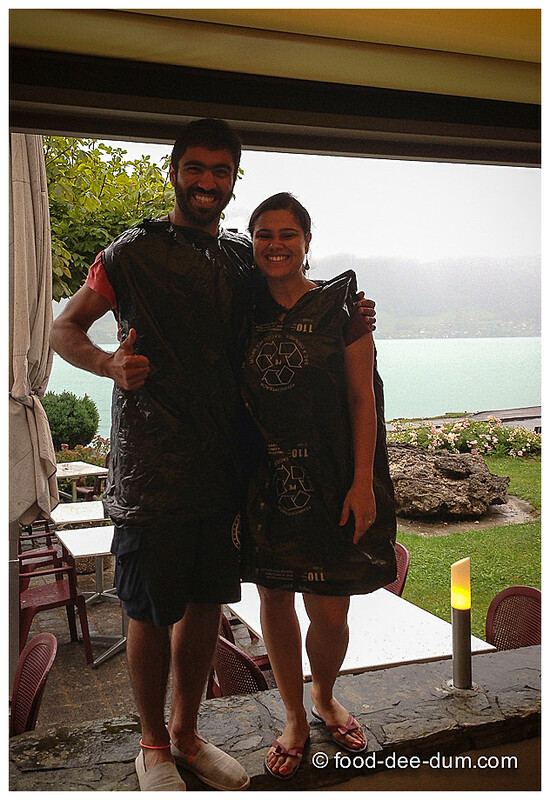 The rain stopped for a while and Adit & I took a kayak out into the lake – returning only when his friends arrived. I don’t have any photos of that because I just couldn’t risk taking my phone in the water! 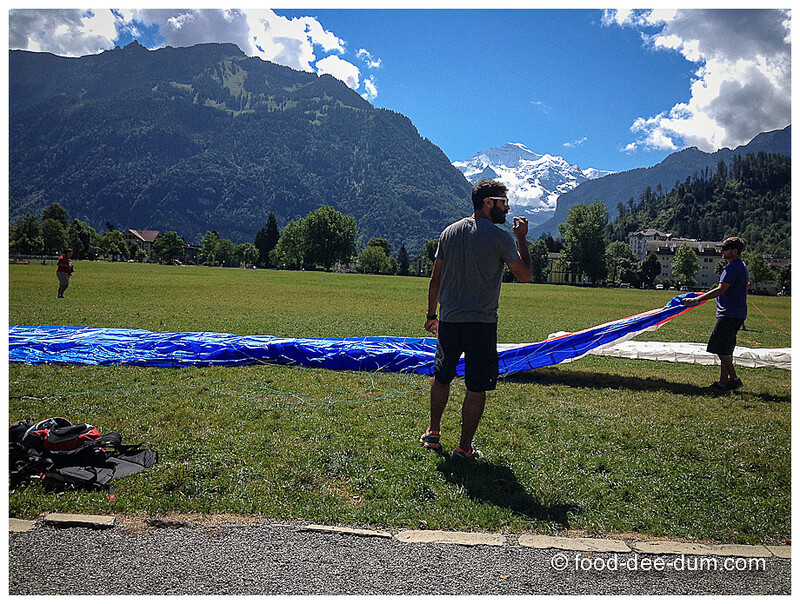 The next day, we checked out of the hostel and returned to Interlaken to para glide! 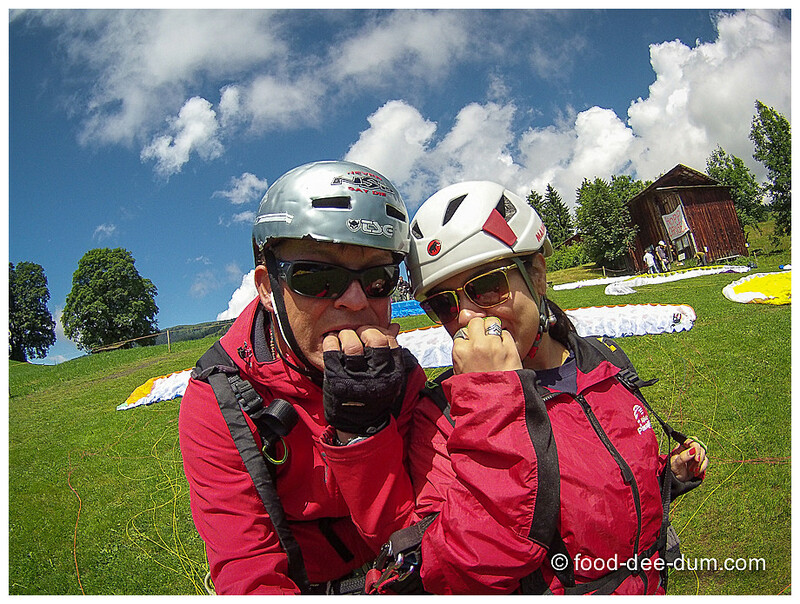 Taking the bus back to Interlaken Ost, we stashed our bags in a station locker and walked about 10 minutes to reach the Victoria Jungfrau hotel – the open field in front of it is the assembly point and landing field for all the paragliding companies operating in that area. Oh and, also, there is an unobstructed view of the Jungfrau from the hotel, but obviously it comes at a price. From there, the company instructors took us up to the take-off point, in a small village called Beatenberg, approximately 15 minutes drive uphill, and got us all fitted out! Our pilots – Jerome (with Adit) and Michi (with me). I was terrified to begin with, but had a fantastic time! 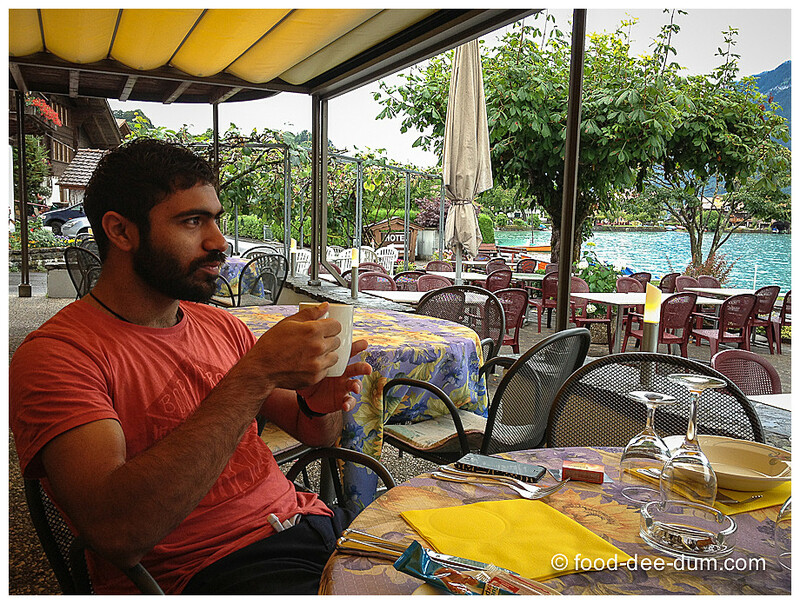 Jerome was Adit’s senior at Uni and cheated a bit by giving us both a longer ride than most! 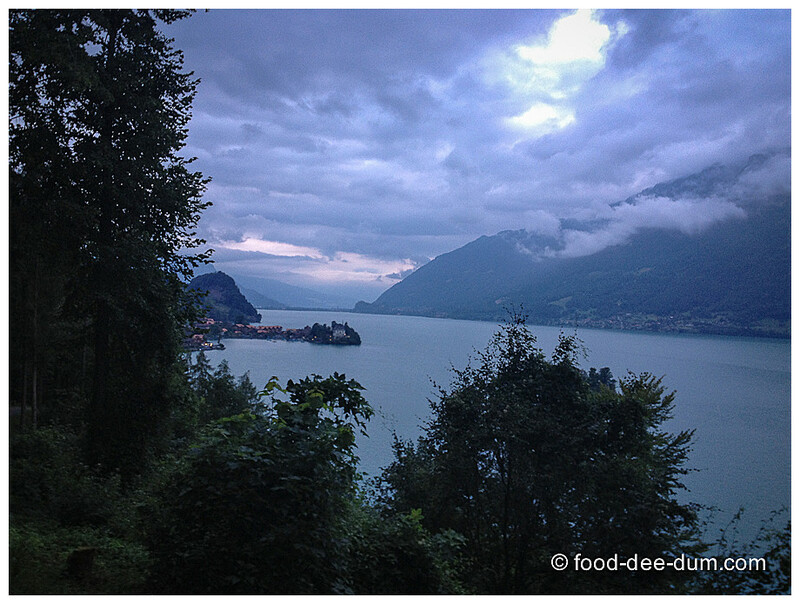 After a nice lunch with Jerome at Des Alpes – just across from the landing field – we made our way towards Lake Thun. We were to return to Lausanne later that evening and originally wanted to head to Lauterbrunnen for a few hours before the evening train – a small village within a steep valley and known for beautiful waterfalls. 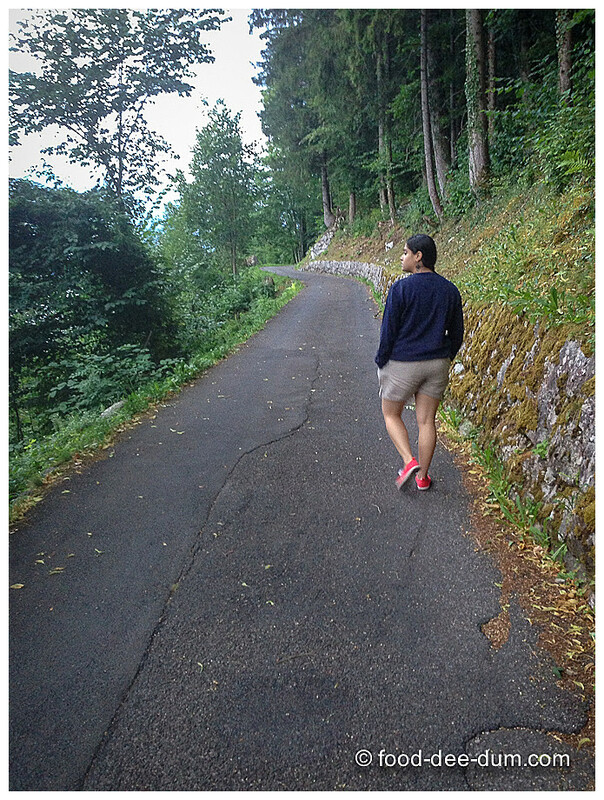 But because of some programme confusion with Adit’s friends, we were short on time and decided to walk to Lake Thun instead. Everyone we asked said it was 20 minutes away from the Interlaken Ost station but it was actually about 5 kms away and took us over an hour. The view along the way was very pretty, but the distance also left us with little time at the lake! Half a bottle of wine, a packet of chips and many skipping stones later, we decided to head back and caught our train back to Lausanne! All in all, the region was beautiful. I wished that the weather had held out better so we could have taken in some more outdoor activities – cycling/ hiking/ kayaking – but I won’t complain. 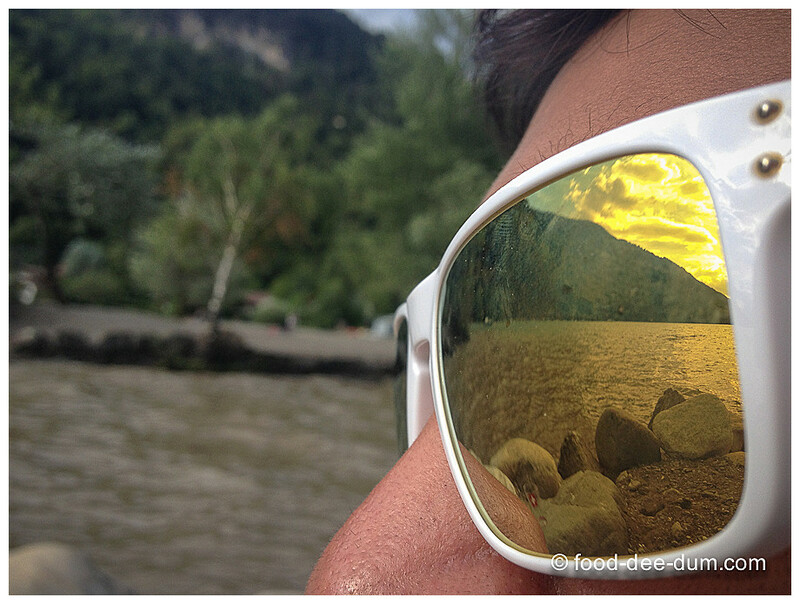 The lakes were beautiful and food excellent. And we got some quite time in the village and caught up on so much. Sibling quality time really is an important thing, I can tell you! Interlaken: connected to Basel, Berne, Zurich, Geneva & Luzern by frequent trains. Most trains stop at both Ost and West stations, but West is closer to the city centre. Our train from Lausanne took a little over 2 hours and cost us about 53 CHF one way. There are also options of flights and road travel. 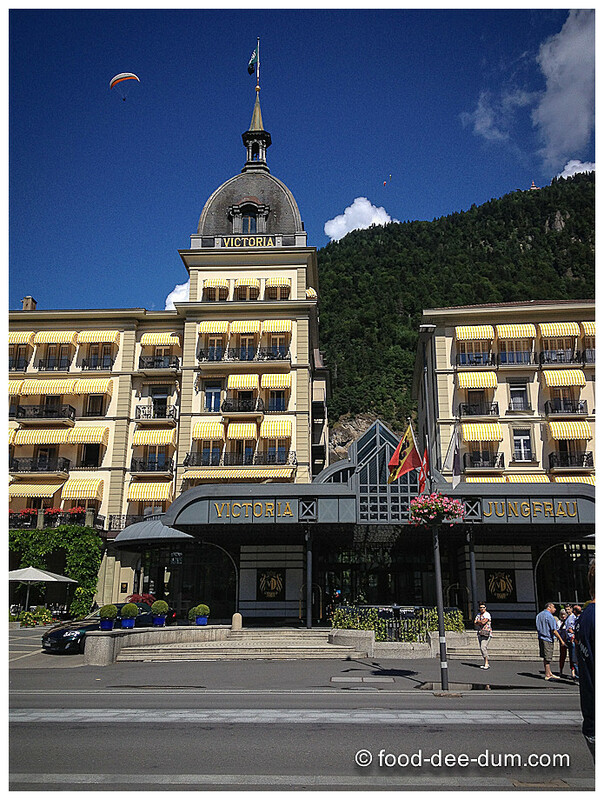 Iseltwald: 20 minute bus ride from Interlaken Ost – once you get to your hotel/ hostel, ask for the bus pass which allows you to go to & from Interlaken on the bus for free. Also, make sure you check the last bus timing from Interlaken and from Iseltwald – it was around 9-9:30 pm when we were there. Lungern: most trains between Interlaken & Luzern/ Zurich will make a stop at Lungern. It is about 1 hour from interlaken Ost and costs approximately 20 CHF one way. Lauterbrunnen: narrow guage train from Interlaken Ost takes about 20 minutes (approx 7-8 CHF) or you can bicycle approximately 12-13 kms. Jungfrau: by train it takes a little more than 2 hours and costs about 200-250 CHF return fare per head. There are other larger hotels in the area like Chalet du Lac, hotel Bellevue and Strandhotel as well as chaltes/ holiday homes for rent. The hotels have attached restaurants for food. If you’re more keen on staying in Interlaken proper, the Backpackers Villa Sonnenhof was recommended to me recently (short walk away from The Victoria – Jungfrau mentioned above) and I’ve bookmarked it for a future trip. You can read more about it on HostelGeeks. 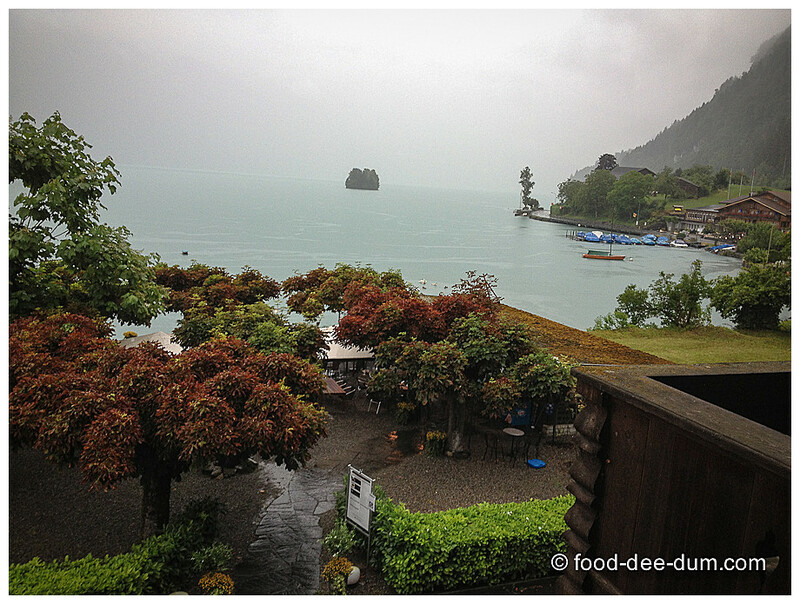 Find a small village around Lake Thun or Lake Brienze, like Lungern and Iseltwald and enjoy the quiet village life. Hike, camp or bicycle to explore the area. Kayak, sail or paddle board on the lake. Relax and read by the lake, preferably with a picnic lunch. 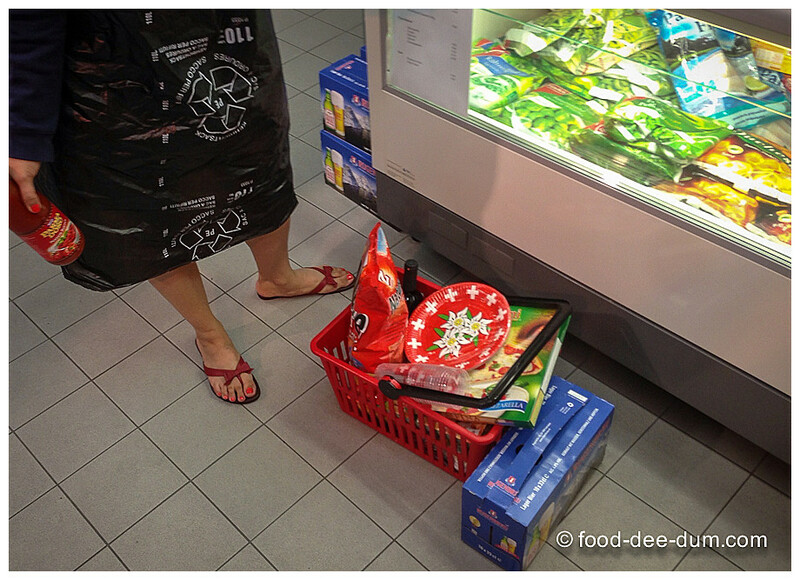 Enough picnic and cooking supplies are available at the local village store – try the local cheese, wine and beer. 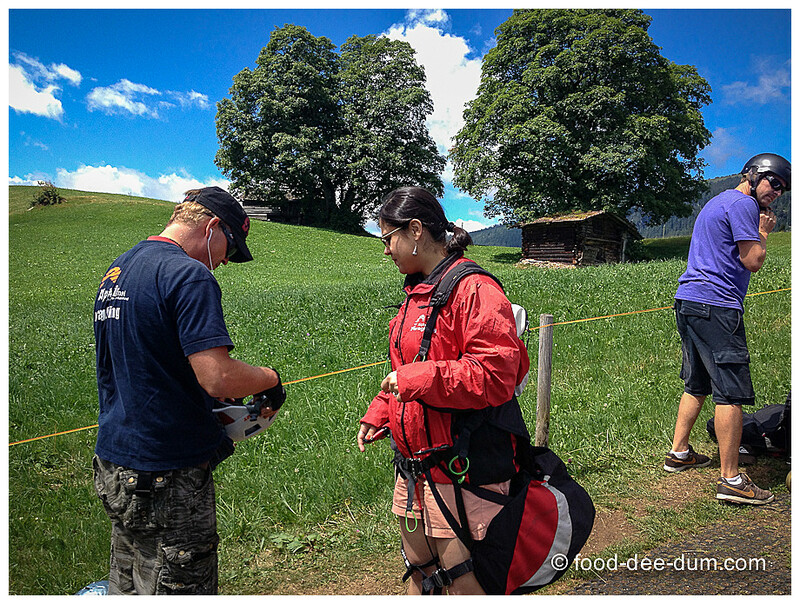 Try your hand at an adventure sport of your choice in Interlaken proper. If you want to para glide, you can contact AlpinAir and ask for Jerome and/or Michi! They were amazing with us and I’m sure that they will show you a good time. 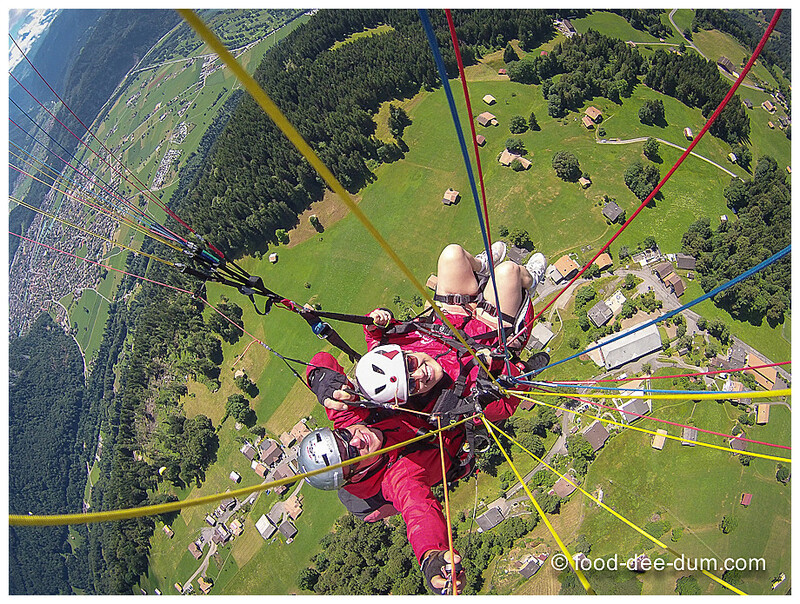 Else, there are also other companies like Paragliding Interlaken and Star Paragliding. 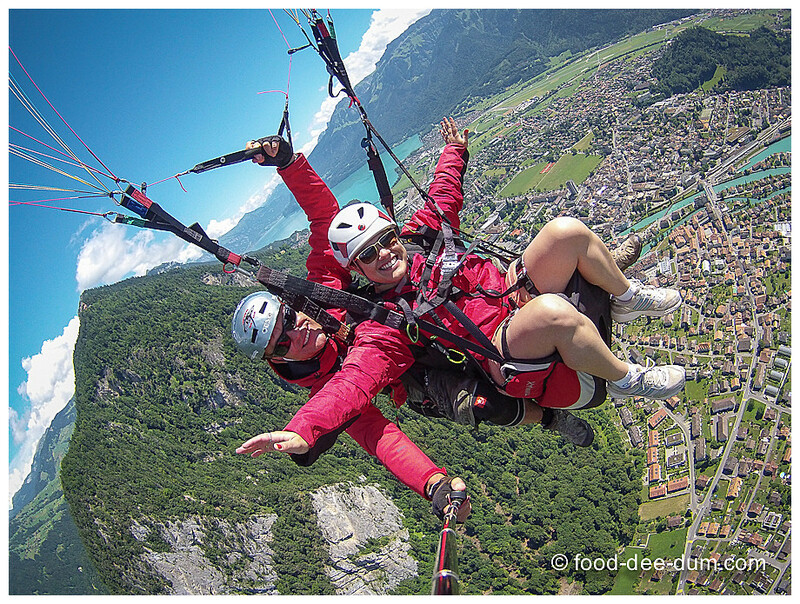 It will cost approximately 170 CHF per head for 12-15 minutes and an extra 40 CHF for the photos that your pilot will take with his GoPro during the flight. Adit & I are big fans of buying a picnic lunch from the Coop stores or a local grocery store – bread, cheese, meat, chips, maybe dessert, beer or wine. That could cost anywhere from 10 CHF to 50 CHF per head, depending on how indulgent you’re feeling. On average, 1 baguette/ other loaf + 1 cheese + 1 packet cold meat + 2 drink (alcoholic or non-alcoholic) + 1 chips would cost approximately 20-25 CHF. Do try the local cheese/ beer/ wine from the region when packing lunches. 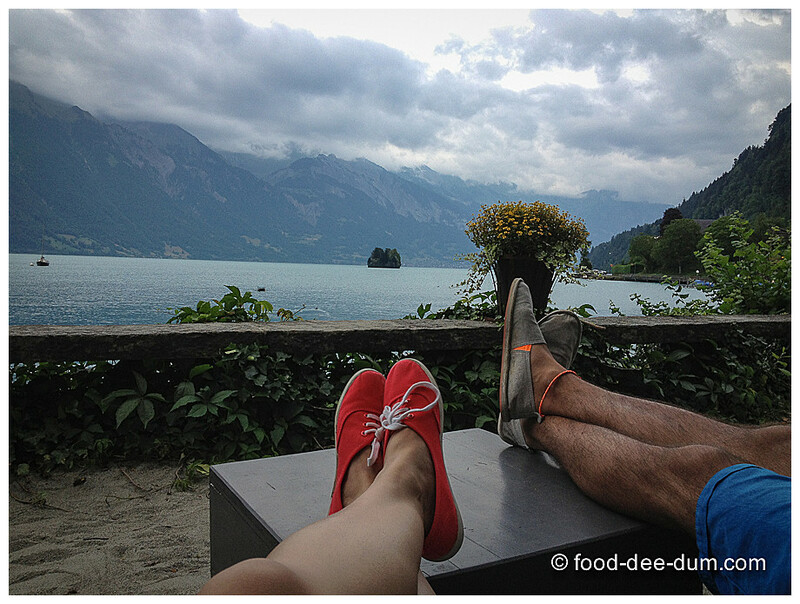 Des Alpes in Interlaken cost us about 50 CHF for 2, including food and a large beer each. Chateau du Lac lunch with 2 hot chocolates, 2 carafes wine, 2 main course cost us close to 80 CHF for both. Dinner at Restaurant across from Lake Lodge (can’t remember the name for the life of me) in Iseltwald cost approx 50 CHF for 2 main course, 1 salad and 2 large beers.